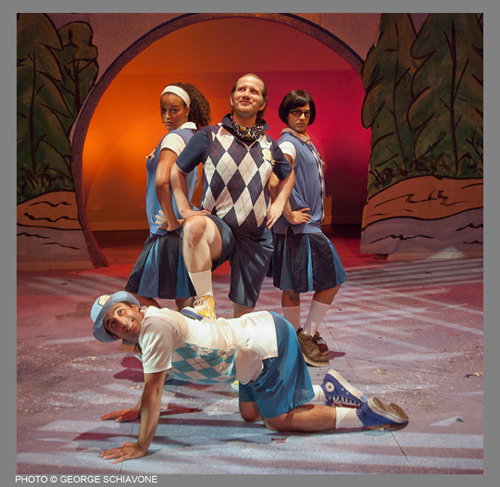 Last year, the Adrienne Arsht Center and City Theatre co-presented the world premiere production of Camp Kappawanna, an original musical inspired by Lisa Loeb’s Camp Lisa CD. The show played to happy family audiences that packed the theater for its two-week run and got rave reviews for its catchy music and loveable characters. This year, the hit musical—born and developed in the Center’s Carnival Studio Theater—is back by popular demand and goes on the road to delight audiences up and down the South Florida coast! The Kravis Center in West Palm Beach, the Broward Center in Ft. Lauderdale, as well as the Adrienne Arsht Center, all play host to the musical theater treat that will satisfy families looking for something fun and entertaining to do this summer! Camp Kappawanna celebrates timeless camp experiences with hip music penned by Grammy-nominated singer/songwriter Lisa Loeb along with a book by Miami’s own Marco Ramirez. From beginning to end, Camp Kappawanna makes audiences of all generations feel as if they, too, are joining in the fun of summer camp! Top Ten for the 2010 Season of "So You Think You Can Dance"
Ruiz and Wong are just two of thousands of talented dancers who auditioned for the show last January on the Adrienne Arsht Center’s Knight Concert Hall stage, as well as in Chicago, Nashville, New York, and Los Angeles. Sadly, the reality series voted Jose Ruiz off this week. With only six dancers left this season, Ruiz will not go on to compete for the title but will continue on the SYTYCD national tour. Wong, who was a top contender, unfortunately was disqualified due to a lacerated Achilles tendon, but will compete next season. Wong, 23, was a firehouse throughout the season, and it devastated both the judges and audiences when his injury caused him to leave the show. Host Mia Michaels told audiences that the show lost, “One of the greatest dancers – if not the greatest dancer – to ever come through our stage.” Wong is a former principal soloist with the Miami City Ballet, awarded this position when he was only 17 years old, after winning the prestigious “Prix de Lausanne” competition. Originally from Pembroke Pines, Ruiz taught himself to dance at age 14. After developing his own style and technique as a B-Boy, Ruiz began competing around the world. This competition has provided him opportunities to step outside of his comfort zone with completely different styles of dance ranging from Bollywood to the quickstep. Without professional training, Ruiz amazed the judges with how well he performed each week. While on the road for their nationwide tour, the cast of the Tony Award-winning musical In the Heights, which arrives at the Sanford and Dolores Ziff Ballet Opera House this March, has taken some breaks from their live-and-in-person stage performances to prove they can look just as fiery on TV. Writer and composer Lin-Manuel Miranda led his troupe in their signature number, 96,000, on two widely viewed television shows—“Lopez Tonight” and “So You Think You Can Dance.” Miranda received a Tony Award for his hip hop, salsa score for the show about a group of friends living in New York’s Washington Heights. 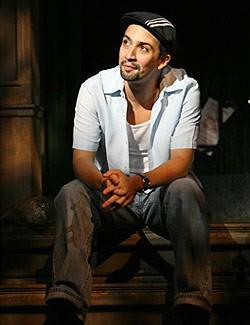 In addition to creating the musical, he also played the lead role of bodega owner Usnavi in the show’s New York production, a role he reprises for the tour’s Los Angeles stop. Appearing on national TV, however, was a whole new experience for the young performer. “It was cool bringing this thing that was created for live theater and molding it for television so that it is contained in this little screen,” she reflects. The fun the cast shared was apparent in its performances on both TV shows. The energy and the excitement of In the Heights reached thousands of viewers and this powerhouse musical has again proven its power has no limits. Relive the excitement! Watch the cast perform on “Lopez Tonight” at http://www.youtube.com/watch?v=mtV4vg_rtnk. The future of classical music and dance at the Adrienne Arsht Center is bright, thanks to a new John S. and James L. Knight Foundation challenge grant that will support the Center’s Masterworks Season through 2013. The $600,000 grant, part of Knight Foundation’s national Arts Program, will be matched with $1.2 million of private sector support, both through private and corporate funding. The first Masterworks Season to benefit from the grant will be the recently-unveiled 2010-11 season, which has been named the “John S. and James L. Knight 2010-2011 Masterworks Season” in recognition of the Foundation’s support. The Masterworks Season series was launched in 2009. Since then, audiences have embraced classical music and dance presented by the Center. Thousands of patrons attended concerts and performances in the series’ first year and ticket sales consistently exceeded the Center’s budget estimates. This year’s season will include the Sanford and Dolores Ziff Classical Music Series, a Signature Dance Series, and for the first time, four Pops performances. Scheduled artists include the Moscow State Symphony Orchestra (Nov. 15, 2010), Hubbard Street Dance Chicago (Dec. 11, 2010), violin virtuoso Joshua Bell (Jan. 18, 2010), Alvin Ailey American Dance Theatre (Feb. 17-20, 2011), and the Boston Pops Orchestra (March 19, 2011), among others. Visit www.arshtcenter.org/masterworks1011 for additional Masterworks Season information. One name comes to mind when the words dance, surrealism, Latin soul and drag queens come together in the headlines. The talents of the fiercely quirky Rosie Herrera, New World School of the Arts graduate and established choreographer, have again captured the attention of dance fanatics on the national level. 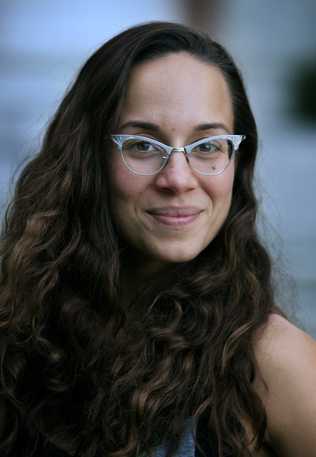 The Hialeah visionary was invited back for the second year in a row to the American Dance Festival in North Carolina, bringing with her the world premiere of Pity Party, commissioned by the American Dance Festival and the Adrienne Arsht Center. Hosted at Duke University, the American Dance Festival (ADF) is the largest, most distinguished and selective showcase of modern dance in the country. Uniting choreographers, dancers, teachers, critics, musicians and scholars alike from around the world, ADF prides itself on being “One of the nation’s most important institutions” (New York Times). Various Stages of Drowning: A Cabaret, the piece that originally catapulted Herrera to national prominence, premiered at the 2009 HERE & NOW new works festival in the Center’s Carnival Studio Theater, co-presented by Miami Light Project and the Adrienne Arsht Center. It crossed traditional arts boundaries by incorporating multiple media of art-dance, theater, opera, cabaret, and video along with a unique list of characters—drag queens, bakers, and a 4-year-old, to list a few. She successfully pulled together a piece that mimicked a dream-like state and it caught the eyes of the director of the prestigious American Dance Festival. Earlier this year, Herrera returned once more as a guest artist to HERE & NOW, where she presented a preview of another brand new piece titled Dining Alone that focuses on solitude and aging. Also commissioned by ADF and the Adrienne Arsht Center, the dance will receive its official premiere at the American Dance Festival in July 2011. With such an exciting track record, the arts audiences and presenters alike are waiting in anticipation to see what Herrera will bring to the stage next. The World Premiere of Herrera’s Pity Party took place at ADF on Monday, July 12. The Adrienne Arsht Center is brimming with pride for the local’s success and is excited to watch as one of its own continues to stun the world with her gale force talent. Check out the first-hand behind-the-scenes account at ADF with our very own Scott Shiller, Executive VP of the Adrienne Arsht Center, here. 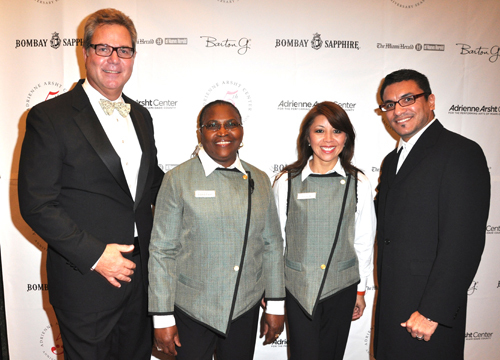 Members of the Adrienne Arsht Center Board of Directors and executive team celebrated talent and glamour last week at Radio City Music Hall during the 64th Annual Tony Awards, offering moral support for our “family” of performers. The reigning performances from last season- which included Billy Elliot, Hair, Shrek The Musical, Rock of Ages and West Side Story, were no match for this season’s record-breaking ticket sellers honoring musicals that provide a playground for Tinseltown’s A-listers and a stage for Afrobeat, Blues, Frank Sinatra and rock and roll to live together in harmony. Winning Best Musical and three other categories was the original story set in the American South in the 1950s, Memphis. Two-time Academy award winner Denzel Washington and Tony-winner Viola Davis became the first black performers to win best actor and best actress award in the same season. The life of the party, host Sean Hayes delivered steamy scenes with co-host Kristen Chenoweth and continued the night with comical wardrobe selections and poking fun at both Hollywood and Broadway. One of Hayes’ co-stars in Promises, Promises, scene-stealing Miamian, Katie Finneran, won for best featured actress in a musical. Best featured actor in a musical went to Levi Kreis as rock ‘n’ roll wild man Jerry Lee Lewis in Million Dollar Quartet. The nights biggest winner, Red, took home Best Play and five other categories, including Best Direction. Back in a revival from the 1984 original, “La Cage aux Folles” took home three awards including Best Musical Revival and Best Actor. Greenday also took the stage, performing scores from the acclaimed musical American Idiot. Never has there been a dominant presence of Hollywood actors in Broadway, ranging from Scarlett Johansson, to heart-throb Wolverine actor- Hugh Jackman. A victory for Hollywood actors followed nearly all acting nominations, including Catherine Zeta-Jones in the musical about love’s endless possibilities “A Little Night Music” and Johannsen’s first Tony for “View From the Bridge”. Other notable nominees were Jude Law in Hamlet, and Red’s Alfred Molina. Overall, the Tonys demonstrated a resilient Broadway family and that more than ever, the presentation has grown to mainstream popularity.